What if the ground beneath your feet, the very foundation of your life and livelihood, was at risk of eroding away? What if the very thing from which you and your community draw 95% of your wealth was at risk of disappearing? This is the reality that Aitutaki, a small island in the Cook Islands, and many other small islands around the world, are facing. Aitutaki, and its stunning lagoon, is protected by a coral reef. Powerful ocean waves crash on the edges of the reef, but because coral reduces wave strength by 97%, the lagoon and the coral sand beaches remain still and calm. The value of this protection, and the environment it creates, cannot be overstated. I spent seven weeks in the Cook Islands as part of my Watson Fellowship studying how ocean acidification might affect communities, and for six of those weeks I called the 6.5 mi2 island with 1,800 residents home. During that visit, I saw not only how delicate the island’s ecosystem is in the face of global stressors like climate change and ocean acidification, but also the value of the thriving economy and society built squarely on its coral. The skeletons of coral are made of calcium carbonate—the same substance that forms the shells of oysters, mussels and clams. As the ocean becomes more acidic, it becomes more difficult for coral and shellfish to form the calcium carbonate they need. Eventually, coral won’t be able to rebuild its skeleton as quickly as it is broken down. Recent studies show that by mid-century, a majority of coral around the world will have trouble building their skeletons. If the coral protecting Aitutaki is damaged by ocean acidification, or rising sea temperatures, the whole island is at risk. The coral not only protects the island from waves and storms, it also creates the spectacular lagoon and marine habitat that supports the island’s dominant economy: tourism. An officer in the Cook Islands Ministry of Tourism told me that he believes tourism accounts for 95% of his country’s GDP. Just like the scallops in Sechura, the economy based on coral and the lagoon extends beyond the water to an entire hospitality industry, ranging from food services to transport to lodging. And just like in Sechura, the economic boon created by marine resources creates immense opportunities and growth for local communities and families. Before tourism, the people of Aitutaki lived off the land and sea. The influx of money from tourism has created a whole new way of life; one in which food is flown in to this remote island from around the world, where islanders go abroad for education, and where traditional knowledge of subsistence living has all but disappeared. Yes, tourism now dominates the economy of Aitutaki and allows islanders more than just a subsistence livelihood. But ocean acidification and rising sea temperatures, the very stresses that threaten the tourism industry, would also damage the island and the ability of islanders to return to a subsistence livelihood. That means it’s just not the current way of life on Aitutaki that is threatened, it is all life. It is their home that is threatened. And that’s what struck me. 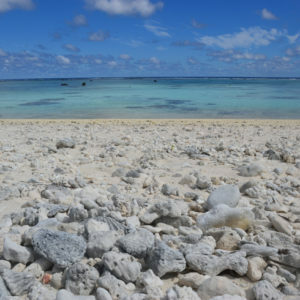 Ocean acidification could impact all life on small islands around the world—islands that, like Aitutaki, depend on coral for the very ground beneath their feet. But that doesn’t have to be Aitutaki’s reality. When I asked the Mayor of Aitutaki, John Baxter, about the future, he said, “I am hopeful.” There is momentum around the world to reduce carbon pollution—the main cause of ocean acidification—and cutting-edge research is being done to better understand how corals respond to changing oceans. But more needs to be done, and we all need to do our part. In the United States, you can support increased funding for science by signing our petition to Congress. Research efforts here can lend important information to islands like Aitutaki, and help give Mayor Baxter a reason to be hopeful.